In this photo released by Warner Bros. shows a taping of "The Ellen DeGeneres Show" at the Warner Bros. lot in Burbank, Calif.
Mary Halsey, the woman who went viral for her rendition of Missy Elliott's hit "Work It," appeared on Thursday's episode of "The Ellen DeGeneres Show" and got the ultimate surprise when the rapper joined her on the stage. As fans will recall, Halsey was catapulted into internet fame this summer after she posted a video of her rapping the song at Goddard Park in Rhode Island. Elliott was such a fan of her performance that she shared it on Twitter and solidified her status as the artist's "funky white sister." "It was a shock. I never expected this," Halsey told host Ellen DeGeneres. "I put it out there and said, 'You want to go viral?' But I never thought it would happen." During her interview, Halsey revealed she's actually been performing the song for 15 years and that she was first inspired to learn the lyrics for a contest back in 2003. "I learned; and I read the words; and I studied it and the reaction that I got was so positive that it became my go-to song," she said. "Everybody wants to hear it." DeGeneres also wanted to hear a live performance, so she asked Halsey to show off her skills on the stage. 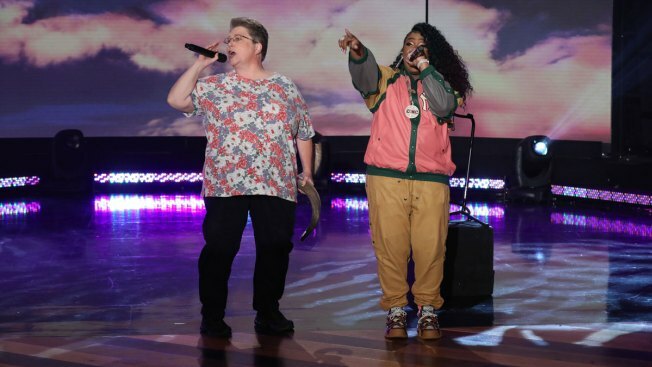 DeGeneres, fellow guest Kristen Bell and the audience members all rocked out to the music as Halsey rapped the lyrics with ease. However, their excitement went to another level after the Grammy winner came out onto the stage and started performing alongside her. Elliott even complimented Halsey on her skills after their performance. "She know all the words, and I forget my own words," she said. "It's amazing." She also gave Halsey an autographed shirt and DeGeneres gifted her a bedazzled jacket that stated "Missy's Funky White Sister" on the back. Original Post: Missy Elliott Surprises Fan Who Went Viral for Covering "Work It"